I went to the Portland Auto Show a few weekends ago to see the new cars for the upcoming year, I know we’ve talked about it already but I really wanted to talk about it. Ok, ok you got me, I really just want another opportunity to talk about / drool over the Mazda 2. 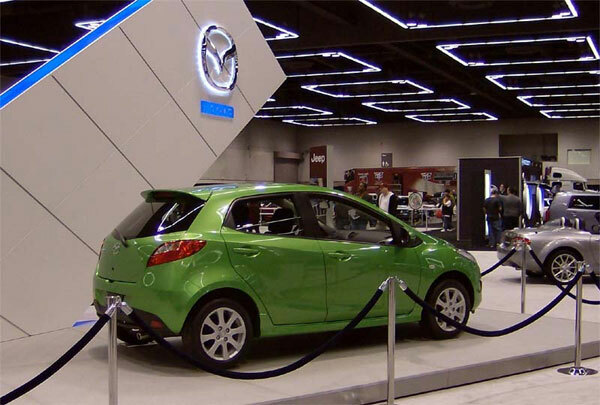 Mazda brought a standard model green version to the show. They had it on a fancy display pedestal surrounded with one of those black rope separators you use to keep people in line at the bank. My first thought after seeing the car in person is “small”. Seeing it in pictures and looking at one in person gives you a better scale of a vehicle size. 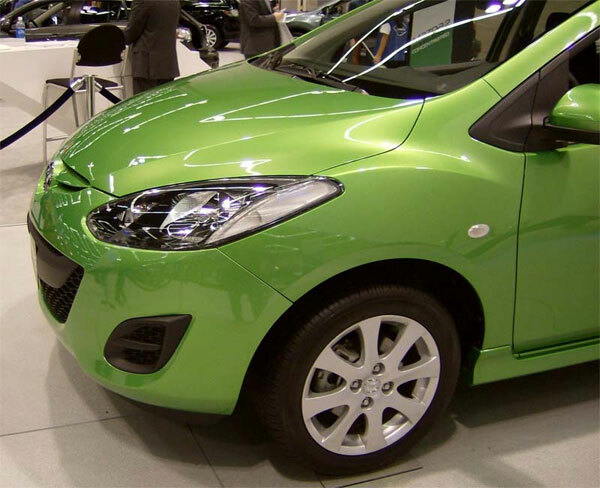 If you haven’t seen a Mazda 2 in person it is bigger than a 88-92 Ford Festiva but smaller than a 90-94 323 hatchback. On the outside the cars lines look better than pictures have shown. I walked around the car checking it out from all angles and I couldn’t find a spot that look off or I would want to change right off the bat. The wheels they used on the Mazda 2 are a good looking 8 spoke wheel. One thing I did not see was the cool looking tail lights that can bee seen on the Japanese models. You can see the LED pattern in the tail light housing below. If they are not an option for North America we will be importing the lights. I wasn’t allowed to hop in the car but I was able to get a good look at the inside. It is roomy for a small car. The inside of the car says Mazda 3. The trim, and design of the interior will make any Mazda 3 owners feel right at home. I had a chance to ride in a 2008 model tuned by AutoExe in Tokyo several years ago. 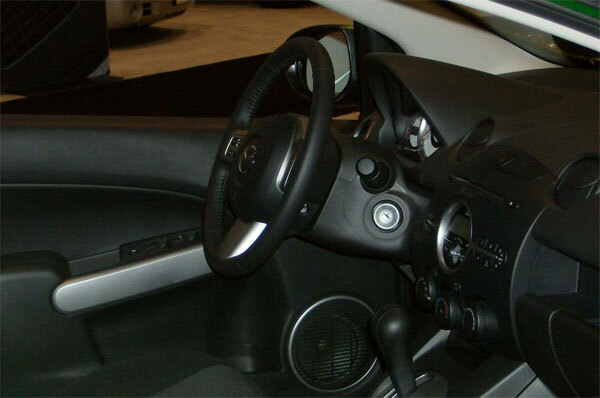 The interior looks really close to the earlier models not sold in North America. Mazda says the interiors for the North America models will be upgraded and have a better feel. I am thinking this will be quality of materials more than styling. Last but not least Mazda was giving away cool cans of Mazda 2 energy drink! They told me it tastes like Red Bull but I and going to save this souvenir. While I was at the show I checked out the Ford Fiesta to see how close it was to the 2 since they share the same platform. 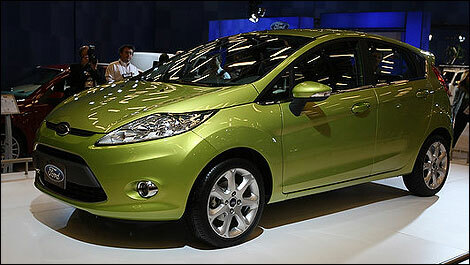 The fit and finish of the Ford left something to be desired. From the exterior to the interior styling you can see where Mazda had put in little touches to make the car look or perform better. 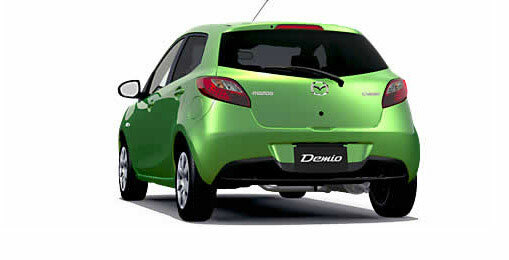 Even the exhaust on the Mazda 2 looked better constructed than the Fiesta. After my trip to the auto show I can say I still want a Mazda 2 and I can’t wait to get one. Mazda says the interiors for the North America models will be upgraded and have a better feel. Thanks for sharing this. Previous PostPrevious Shirt Design Contest Update!